Powers/Abilities: Transformation of things and human beings. Teleportation to his demon's home dimension. (Marvel Comics Presents#20/3 (fb) - BTS) - Some unknown time ago after his marriage Ed Windhart allowed a minor demon to become a part of him. From this time on he infected everything around him with the foul magic of the demon, which turned all his possessions and his son slowly into monstrous beings like himself. He hid the changes with a spell from all the people around him including his wife. (Marvel Comics Presents#19/3) - Ed arrived at home from work and wanted to know who Mary's friend was. (Marvel Comics Presents#20/3) - Ed accused his wife to have an affair but then he recognized Dr. Strange and attacked him. Ed turned candy M & M's into flying demons which weren't troubling Dr. Strange for too long. Ed brought his house and family to the outer-dimension where his demon came from, continued his attack on Dr. Strange, and tried to get to his wife and son. Dr. Strange was caught off guard by Ed while showing Mary what Ed really was. Ed threw Dr. Strange to the ground and stomped on him. Dr. Strange used the Eye of Agamotto on Ed and it burned his skin off. Dr. Strange tried to find anything human in Ed but he couldn't. The Light of Agamotto destroyed Ed and returned the house and Ed's family--cleaned from the devious magic--back to Minerva, Ohio. Mary was blind to the demons surrounding her and welcomed Dr. Strange to her beautiful home. Dr. Strange asked her if she recognized any changes, but she couldn't tell him anything. She wasn't happy when her son Bobby vomited and attacked Dr. Strange, but she couldn't see his demon-form. She told Dr. Strange too late that her husband spent all the time with Bobby, because her husband arrived only seconds after that. Dr. Strange put Mary into a bubble protected by the Crimson Bands of Cytorrak. She learned from Dr. Strange the dark secret of her husband and was now able to see through the illusion. After Dr. Strange returned her with son and house back to Ohio. She thanked him for saving her son and for giving her the last good thought about Ed, from her wedding day when he was still innocent. Bobby was possessed by a separate minor demon via his father's demonic possession. Bobby came home from school and his mother introduced him to Dr. Strange. Bobby vomited on Dr. Strange and turned into a monstrous being. He attacked Dr. 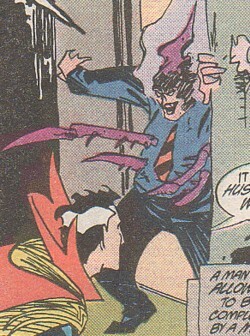 Strange who was able to defeat him (and exorcise the demon) with the purifying Touch of Agamotto. Bobby was put into a magic bubble that was later protected by the Crimson Bands of Cytorrak from his father Ed. He was returned clean from the demons influence to Ohio together with his mother and his home.